Our research program is focused on pharmacogenomics, disease modeling, and regenerative medicine. Applying a combination of hiPSC culture, tissue engineering, sequencing, high-throughput assays, and drug screens, we can establish the genetic cause of a patient's specific drug response and use this information to discover new drugs. One of our primary interests has been in modeling cancer therapy-induced cardiovascular toxicity. This includes heart failure, atrial fibrillation, and peripheral artery disease. To study this we generate hiPSC-derived cardiomyocytes, endothelial cells, smooth muscle, megakaryocytes, platelets, and fibroblasts. This method allows us to recapitulate a patient's off-target cardiotoxic response to drugs such as anthracyclines, tyrosine kinase inhibitors, and monoclonal antibodies. Major mechanisms we study include transporters, drug metabolism, mitochondrial behavior, reactive oxygen species, DNA-damage, calcium handling, and sarcomeric damage. hiPSC-derived cardiomyocytes are a unique tool for cardiomyopathy and hypertrophy phenotype screening. Currently, we are researching why some heart failure drugs only work in specific populations and novel drugs that inhibit and/or reverse these phenotypes in a genetic variant-specific manner. We are studying methodologies for directly reprogramming somatic cells into cardiomyocytes for cardiac cell therapy and the fundamental questions of how we can improve the yield, engraftment, survival, and function of these cells. This work involves the study of immunogenicity, in vivo differentiation, methods for direct reprogramming, and the induction of in vivo cell-type-specific proliferation using small molecules. hiPSCs are unique as a model for cancer as they offer homogeneous unlimited expansion without the phenotypic drifts seen with patient-derived xenograft (PDX) models and without the inability to model early stage cancer seen with immortalized cell lines. We are using these cells in a reductionist approach to model the underlying mechanisms of tumorigenesis, germline influence on drug response, and drug resistance. We are actively researching how modifying the pluripotent state can influence subsequent differentiation. This work includes optimization of pluripotent media formulae, reprogramming methodologies, synthetic matrices, and the maintenance of proliferative differentiation intermediates. We are working on increasingly refined, simplified, and reproducible methods for producing cells of the cardiovascular lineage along with control of subtype specification and maturation. The ability to capture a single human genome in culture as a hiPSC and then differentiate it to any desired cell type holds enormous potential to interrogate the genome. We are interested in how gene expression analysis (RNA-seq) of drug-treated hiPSC-derived cells can be combined with whole-genome association studies (WGAS) to provide differential expression quantitative trait loci (deQTL). In the lab, we sequence hundreds of whole genomes per year. 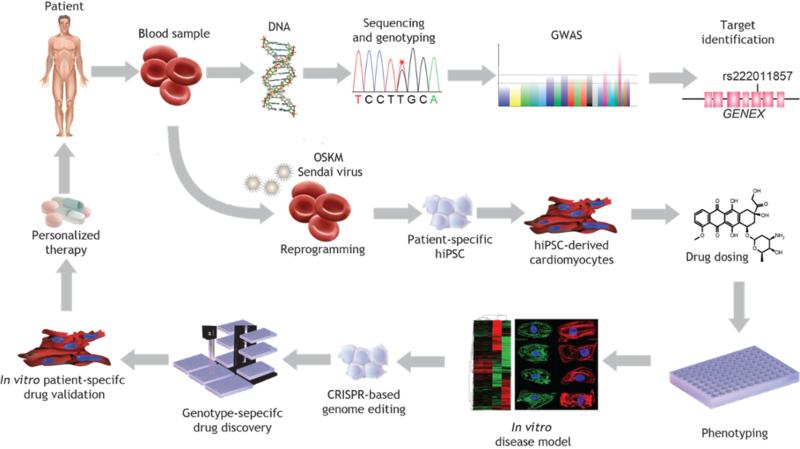 As part of this effort, we are working on numerous tools to enhance whole genome analysis, such as optimization of sequencing methodologies, developing streamlined pipelines. We use a variety of tools for drug testing, including Labcyte Echo 555 liquid handling, automated triple-mode plate readers, a fully automated Nikon microscope with encoded stage, perfect focus, and high-content software, a Vala Sciences Kinetic Image Cytometer for high-throughput calcium and high-content imaging, and a Nanion Syncropatch for automated patch clamp. To functionally validate how SNPs influence drug response, we are performing CRISPR-based knockouts, AAVS1-based overexpression, and SNP corrections. We are also performing both pooled and arrayed CRISPR-based high-throughput screens to discover further probe mechanisms of action. As part of our stem cell effort, we are working on the construction of multicellular organ-on-a-chip systems to better develop the most accurate cellular models to recapitulate the patient's original drug response.